Ever since poker proliferated along the Mississippi in the early 1800s, it has been the quintessential American game. Poker, if played correctly, embodies all of the qualities cherished in our free society including ingenuity, hard work, and perseverance. The ability to read and outwit your opponents, so essential to success at the poker table, is equally important in forging ahead in a capitalist society. Of course, anyone who has spent time in a poker room can attest to the large and random role that luck plays. How one deals with it can go a long way in determining success. In this book, experienced poker player, tournament champion, attorney, and businessman David Apostolico takes core poker philosophies and applies them to various business situations. 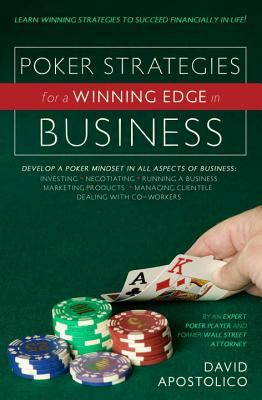 Readers learn how to develop a poker mindset to help them in all aspects of their business lives. Apostolico, who has matched wits with the world's top professionals on the invitation only Professional Poker Tour and negotiated mergers and acquisitions on Wall Street, says there are no hard and fast rules to either poker or business success, yet the skills involved in both are extremely similar. Reading the opposition, adapting to changing circumstances, being innovative, and thinking like a winner are necessary to making a living on the felt or in the board room. Whether you are negotiating a deal, managing your finances, marketing products, running a business, or trying to climb the corporate ladder, a solid poker strategy can prove invaluable. Before you make a move in any of these areas, you should read this insightful book to learn how to play your hand for maximum strength. Description: Paperback. Pictorial cover. No writing in the book. Nice copy. 216pp. Full refund if not satisfied.